I love going to our local Parade of Homes. Impeccable decor. Every single home is new, up to date, and strikingly beautiful. It draws you in, doesn’t it?. Like that new-car smell. Better yet, like the smell of popcorn at the movies. I cave every time. Unfortunately, beautifully-staged homes are not as cheap as movie theatre popcorn. Thank goodness because I love popcorn. 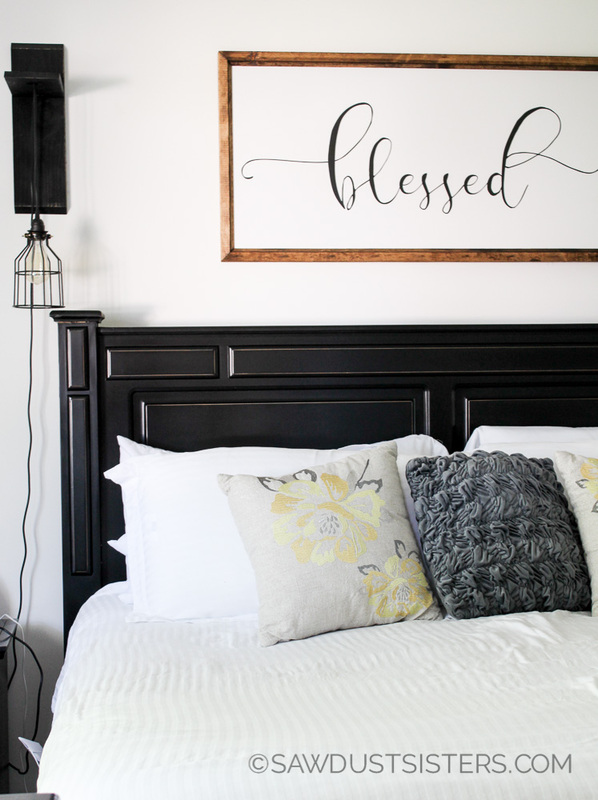 With a little patience and some DIY, cheap bedroom decor is not that hard to find. To be honest, I had no plans on writing a post about budget friendly ideas for the master bedroom. I don’t consider myself a great decorator. Hence the reason buying an already-staged home is so appealing. And in the interest of full disclosure, I sometimes fall in the impulse-buying trap as I try to hurry and get things done now. Instant gratification syndrome. Can you relate? 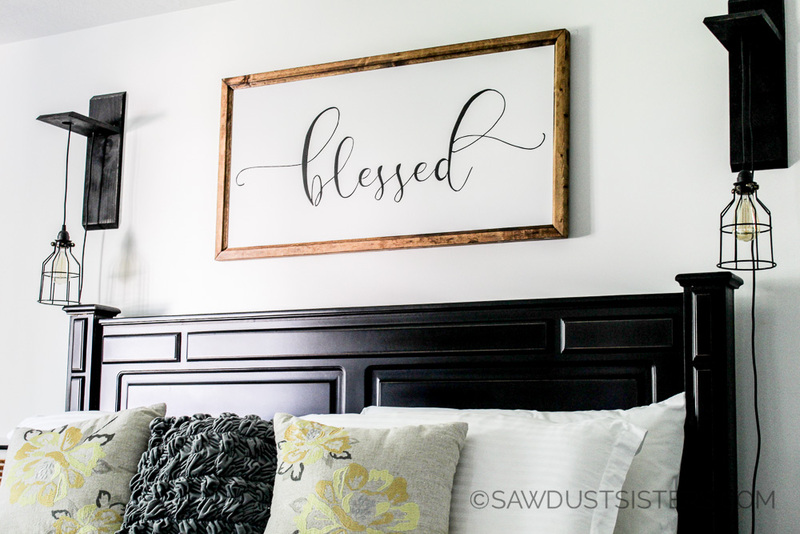 But, as I sat and looked around our master bedroom, my eyes kept landing on DIY projects and bargain purchases I was proud of. 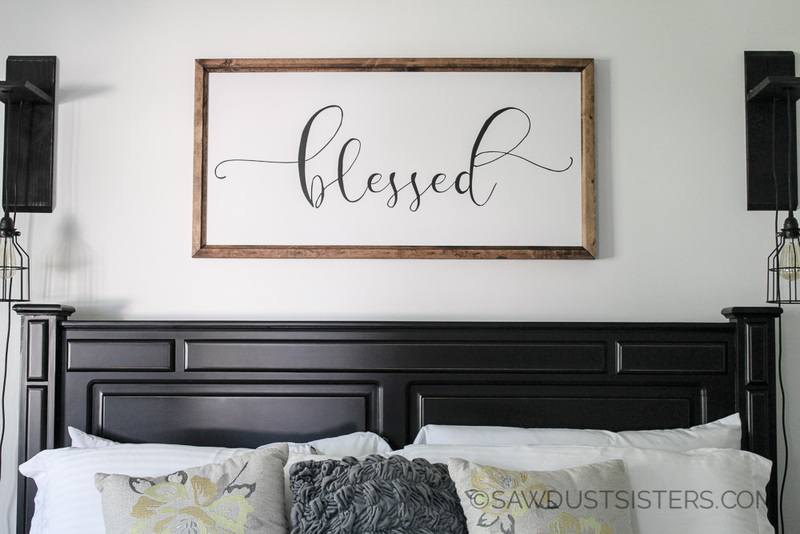 Like this beautiful BLESSED sign, my newest acquisition from small wood home. That space above our bed was bare for many months as I pondered ideas of what to put there. Nothing really spoke to me like this sign did. Forgive me if I sound a little sentimental. But, I have much to be thankful for, as I’m sure you do as well! I have been reminded of my blessings, this year in particular, as my youngest daughter graduated from high school and we are soon to become empty nesters. There is so much joy (and sadness) in seeing your children grow up. But all in all, I feel so blessed. And I love waking up to that reminder. 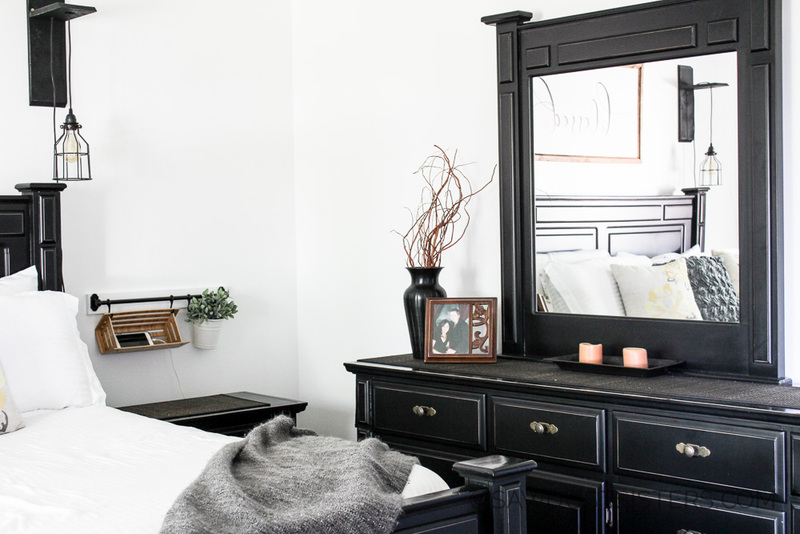 This master bedroom was 15 months in the making. No impulse buying. And while it may not be perfect, it’s perfect for us. More than anything, I was pleased I didn’t break the bank. I don’t think you should take 15 months to decorate your master bedroom, but there’s no shame in waiting and letting the room speak to you. I find that it takes me a few weeks to get used to new accessories before I add others. One thing we decided to do last year was repaint the beige walls with a bright matte white and replace the 17 year old carpet with hardwood floors. Being a small room with dark furniture, the white paint brightened the walls immensely. 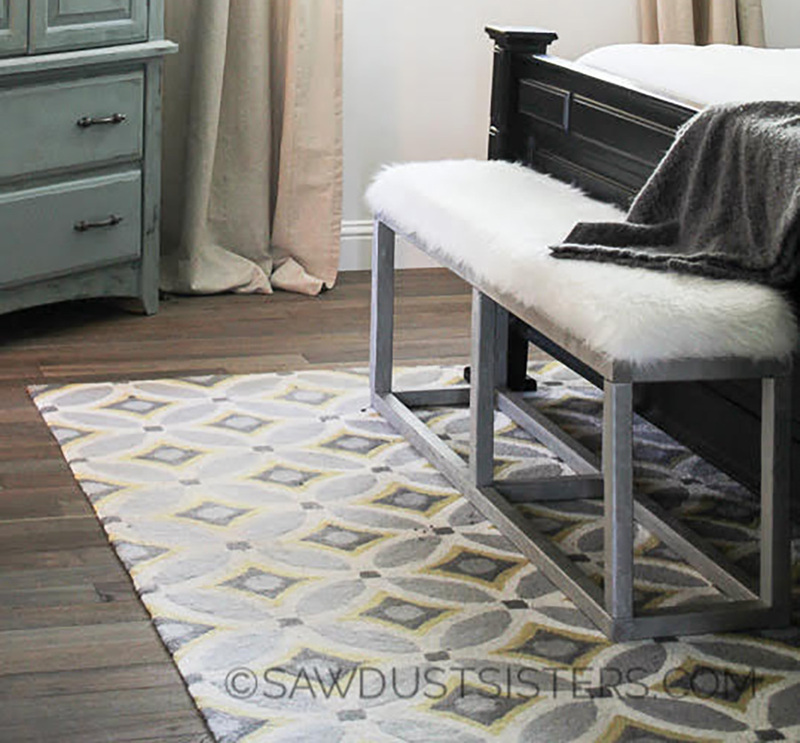 We also opted to use simple textured table runners and placemats on the dresser and nightstand surfaces, since black furniture tends to show every speck of dust. It’s been a game changer in terms of dusting. I highly recommend it if you have dark furniture. As you can tell, I am a fan of neutrals, and I love mixing them up. I used to never mix browns and blacks together. Now I love to do it. style of decorating. My husband is a fan of modern decor. Give him all the clean lines. 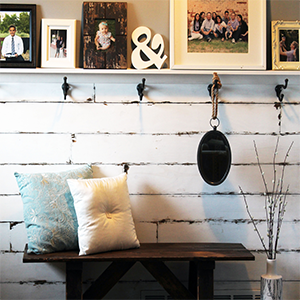 As for me, I like to give clean lines a little character with wood elements and a little distressing. It’s a perfect mix of what we both like. 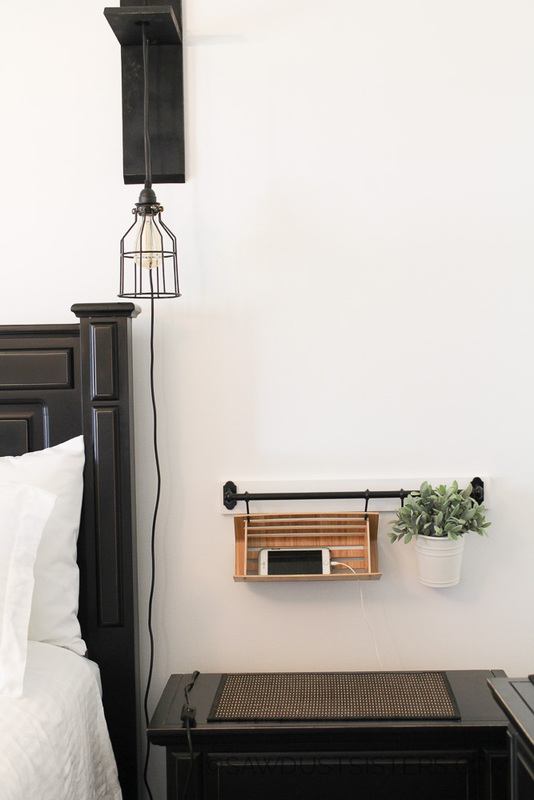 These easy DIY sconces are an example of a clean modern look. They are inexpensive to make yourself. 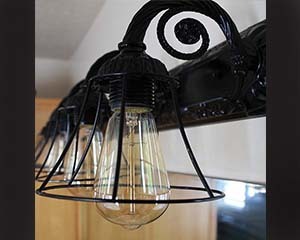 Pair them with cheap light cages and Edison bulbs and you add instant industrial farmhouse character. The power cord plugs into a regular outlet and has an ON/OFF switch attached which makes it so easy to reach over and flip the light on to read. No expensive electrical work required. I have found them to be a fun alternative to bedside lamps. What do you think? The white duvet set is a steal from IKEA. The toss pillows are from Walmart. I love mixing pattern with texture. And did you notice a little color there? If you have a bedside table, there’s a good chance your phone sits on it overnight. This idea came to me as a way to solve an annoying problem. My phone charging cord always fell behind the nightstand. So I headed to IKEA and found some kitchen items that served a better purpose. Now my cord sits tightly in the basket keeping the table free of clutter. Do you think I need to put something on the wall above the charging station? Any suggestions? Moving on down. 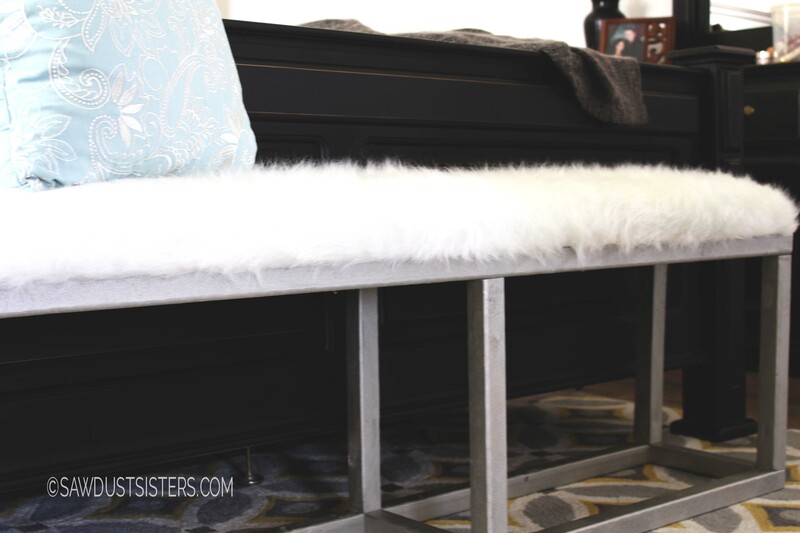 This DIY Upholstered Bench was a special request from my husband. He wanted a place to sit and put his shoes on in the morning. He goes to work reeaaaallly EARLY and sitting on the bed to put on his shoes wakes me up. Because of the small size of the bedroom, I never could find a small enough bench to put at the foot of the bed. As my DIY skills improved, I was able to build one just the right size for the space. I’ll be honest, upholstery isn’t my favorite. I got my first taste when I re-covered these dining chairs and I found that it wasn’t too bad!. Similar to the chairs, this bench upholstery is fairly quick and easy. The fabric I used is very forgiving because there’s no pattern to it. This saves you from having to match things up or keep things straight. Bonus. 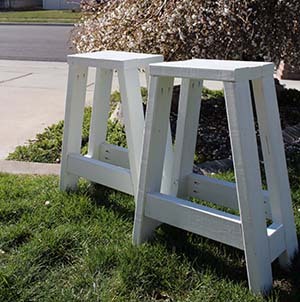 If you want to start with a simple upholstery project, benches are a good place to start. I put together a video tutorial for upholstering the seat. As you may have figured by now, the frame for this bench is made from wood (shhh, don’t tell). 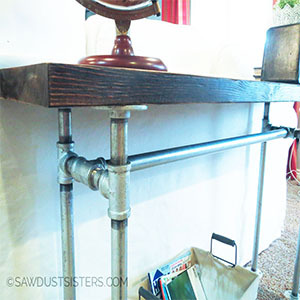 My inspiration came from a much more expensive metal frame bench I found online. I used metallic spray paint to achieve the look of metal. The rug was a steal from At Home. You can find it here! I opted for a 5’x8′ size, to keep it more affordable under our King size bed. Some days I wish I would have bought the large, but I’m happy with the savings. Right across from the bench is this gorgeous floor mirror. This was a gift from my husband. He did so good! He bought it at our local Home Goods two years ago. 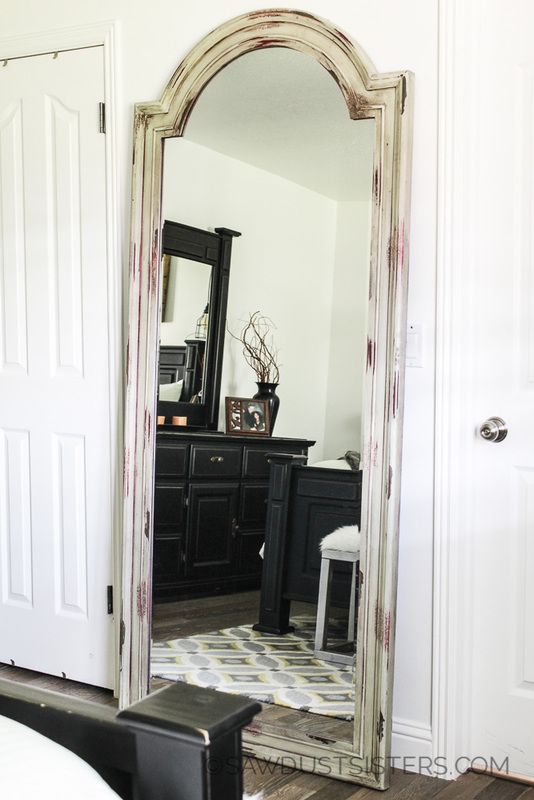 This mirror lived in my Yoga room for a while, but after I found myself going to the Yoga room every day after I got dressed, I decided this mirror needed to move closer to my closet. So, it moved in two months ago. Now I need to figure out what to put in the yoga room. I love the chippy look of the frame. Neutrals with a pop of dark red. The door to the left of the mirror is my small walk-in closet, and the door to the right is my master bath, which I have started to update on a budget. This project is one of my first DIY’s. I almost gave away this armoire because its dated yellow tones did not float my boat anymore. When I finally decided to paint it last summer the transformation was amazing. I am so glad I didn’t give it away. 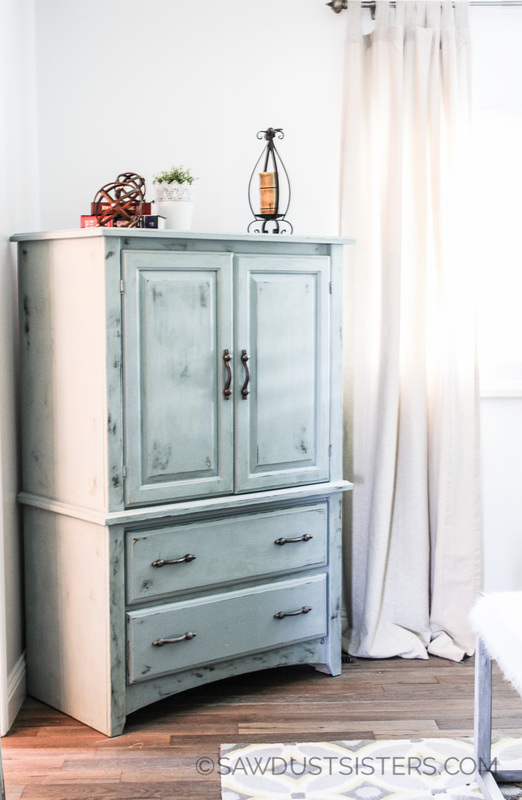 I used my favorite color of milk paint for this piece. There’s some color layering, as you can see. Be sure and check out the tutorial if you have a similar project in mind. Lastly, the neutral curtain panels are from IKEA. I love how that they carry super long curtain panels (and super cheap!). They come ready for you to hem. I actually left these un-hemmed and let them bunch at the bottom. If you have low ceilings like we do (8 foot) hang them as close to the ceiling as you can, to give the illusion of higher ceilings. At first I was hesitant to hang beige curtains against true white walls, but I like how the beige on the curtains warms the space and brings up some of the hardwood tones. Most of us are average people who can’t afford high end decor (I’m a teacher, need I say more? ), but that doesn’t mean our homes can’t still look beautiful. 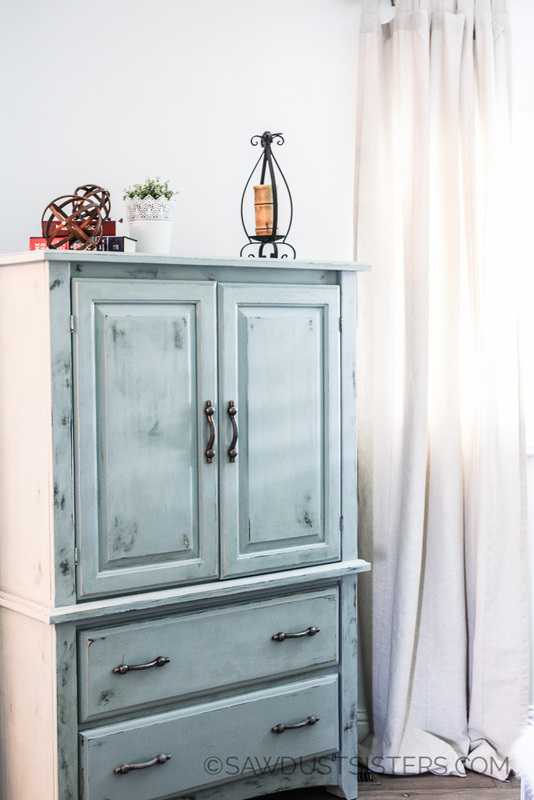 With a little creativity, some DIY, repurposing, and bargain shopping, you can create a beautiful room, on a budget. 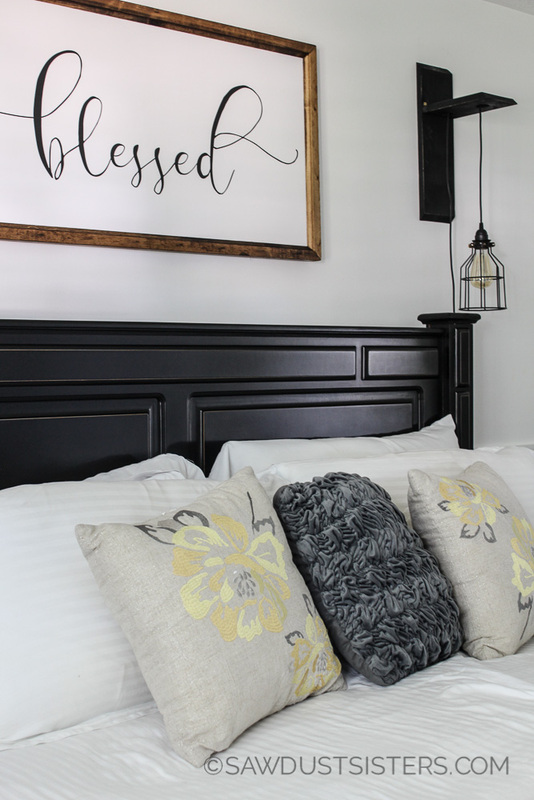 What finally persuaded me to write this post was the realization that my master bedroom is already staged. Even better than the Parade of Homes. Every piece of this room has a story. 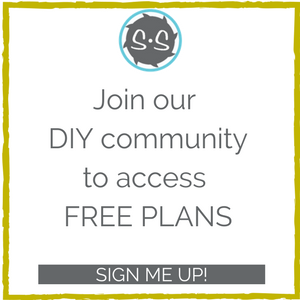 If you like my posts, join our DIY community and be IN on the budget friendly ideas and DIY projects. You can also find me on Instagram and Facebook. 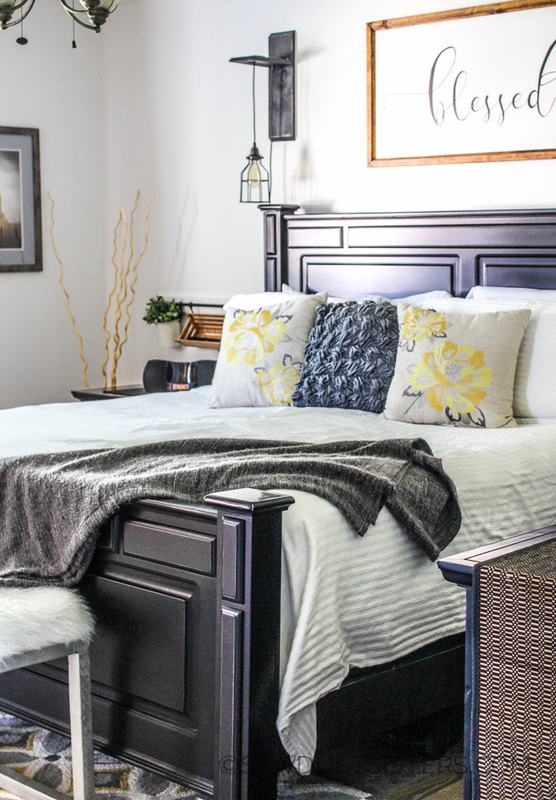 Do you have other tips for renovating master bedrooms on a budget? Anything you think I should add to my bedroom decor? Thank you SO much for taking the time to read this and for letting me share my master bedroom DIY journey with you all. I am in love with your bedroom space! 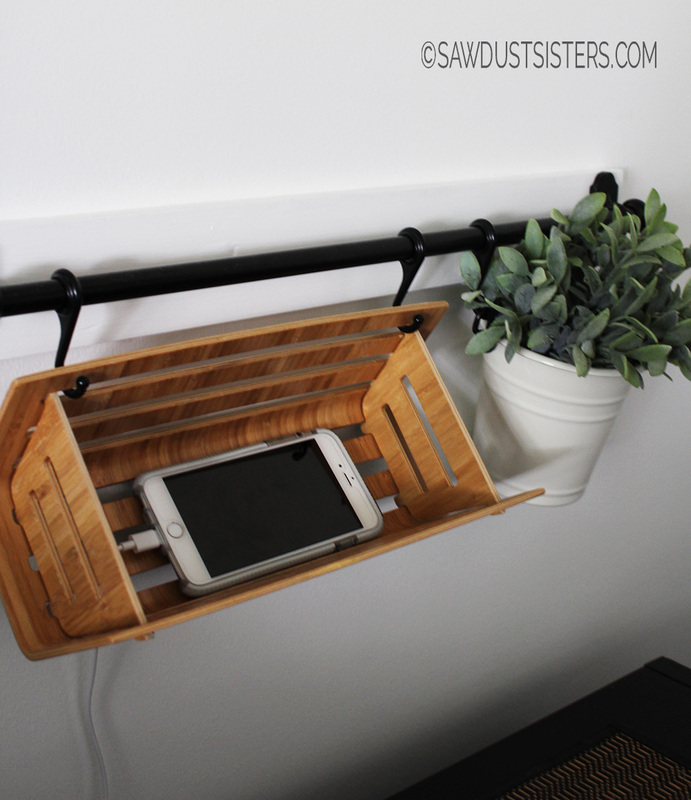 I love the phone charging station. What a great idea! Also, that mirror!!! Everything about your space is gorgeous! Oh, and the wood floors are stunning! Gosh, I forgot to mention the blessed art. I am so in love with it! I will have to figure out how to get one and soon! Thank you for your sweet comments Carolann! So many whites in the world. On which did you settle for the walls? Lovely! Hi Sheryl! I am always overwhelmed by the whites, too! So, I simply grabbed two cans of white off the shelf from the sherwin williams store. The color looked “white like snow” to me and the was good enough. It was a matte finish. That is some incredibly beautiful work. I was already looking for bedroom decor ideas and finally I found them on your article. I am totally inspired with your work and I enjoyed over reading your blog post. Thanks for sharing.